Located in the Big Bear Embayment of Kentucky Lake, at the point of Malcolm and Bear Creeks sits Big Bear Resort on Kentucky Lake. The resort has a rich history of providing family friendly entertainment on the water and comfortable accommodations that keep their guests coming back year after year. The resort opened its doors as a fishing camp in 1948. 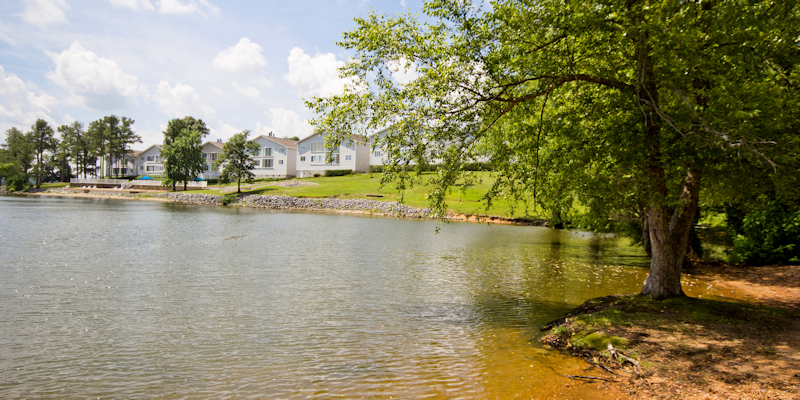 Louisville schoolteacher Robert MacFarland and his wife had taken a trip to see this newly established lake in far western Kentucky. What began as a leisurely visit for the couple, turned out to be the opportunity of a lifetime. 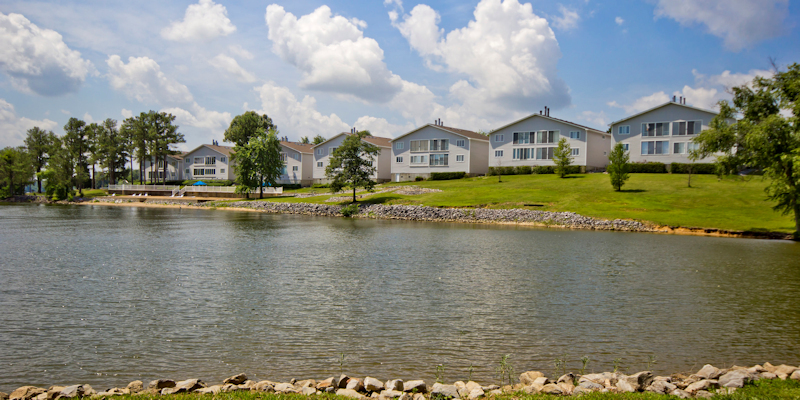 The fishing camp that opened almost 70 years ago has grown into what is known today as one of the finest resorts in western Kentucky. It's important to the resort's owners Rick Meier and Janet Caldemeyer that Big Bear Resort remain a place for Kentucky Lake vacationers and their families to enjoy good old-fashioned fun, matched with modern amenities. Throughout the years, the resort has added fishing cottages, woodland villas, secluded chalets, marina townhouses, condominiums and even a restored 1802 log cabin. Depending on the number of persons in one's party, Big Bear offers a plethora of vacation rentals that range from quaint cottages to more lavish executive accommodations. 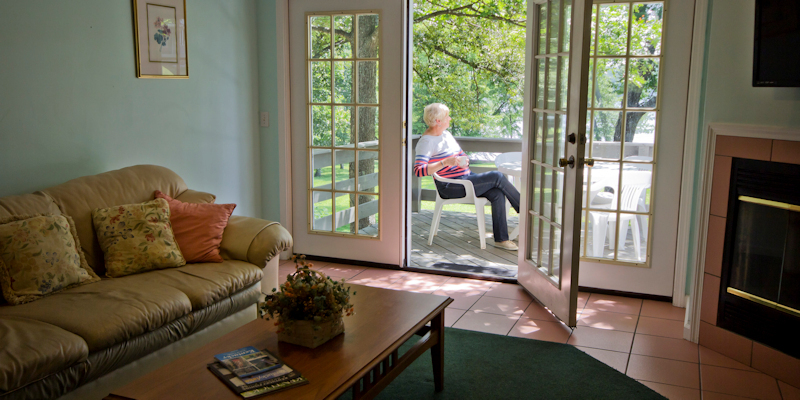 Many of the lodgings at the resort provide a clear view of Kentucky Lake and others are hidden away in the resort’s most private settings. Those wishing to bring along a camper or to "rough it" in a tent, will find the campground sites at Big Bear convenient and comfortable. Campsites are a short distance from fun-filled attractions including water equipment rentals, a swimming pool and private beach. 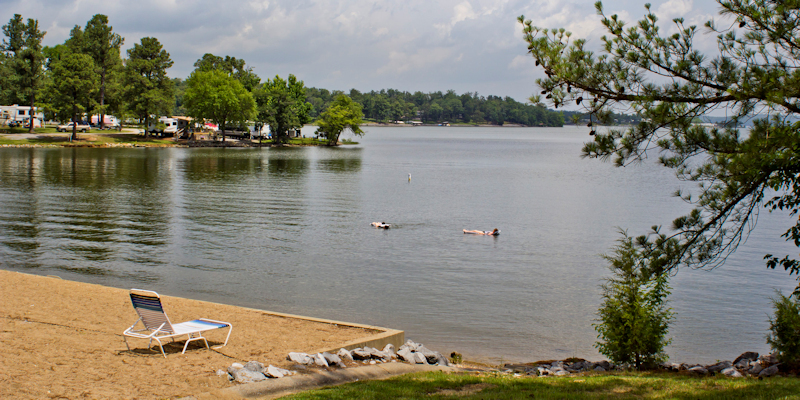 Those camping at Big Bear enjoy boating and water activities on Kentucky Lake during the day and campfire chats in the evenings. Pets are welcome in the campgrounds and some of the accommodations. Some of the region's best fishing holes can be found around the resort in Malcolm and Big Bear Creeks. 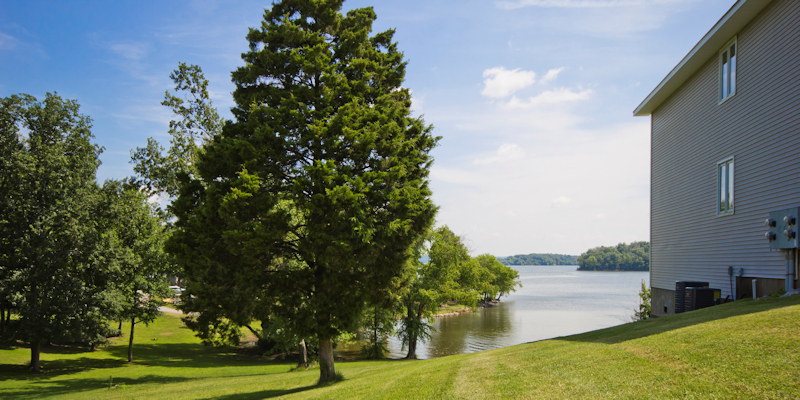 Guests travel from every part of the country to enjoy fishing on Kentucky Lake, a place that prides itself on being a world-class fishery that attracts bass, crappie, smallmouth, panfish, sauger, white bass and catfish anglers to its shores. Fishermen at Big Bear will find artificial cribs and fish attractors that the resort has set in bays found throughout the resort. From fishing to boating, Big Bear’s full-service marina has everything boaters will need to plan a weeklong fish-a-thon. The marina features non-ethanol ValvTect Marine Fuels at their fuel station, including diesel fuel, a boat launch with trailer parking, 135 covered and open boat slips with electric hook ups, a fish cleaning station, outboard oil and basic boating supplies, as well as live bait and tackle. Big Bear's marina guests will also enjoy fishing guide service provided by Rodney Hairgrove and a convenience store that sells groceries, snacks, beer and gifts. While some like to bring their own boats and water equipment, there are others who like to travel lighter. For the latter, Big Bear offers boat rentals, ski rentals and tube rentals. All water equipment can all be leased through Big Bear Resort's Marina. Guests of Big Bear have few reasons to leave the resort once they arrive, as accommodations include fully equipped kitchens and other homey amenities. However, for those seeking a change of scenery, there are also several restaurants found in Benton and other nearby lake communities that lake dwellers often enjoy. See the Big Bear website for a list of nearby activities and attractions.